For more than 15 years, I’ve been involved in creating San Diego backyard designs for residential clients. I’ve seen a great deal of change in this time as we’ve moved into a more environmentally aware period. Certainly the recent drought has been a major influence in removing lawns and adding more hardscape. “Outdoor rooms” entered the scene a decade ago. Adding areas or incorporating edibles into the backyard plan has become huge. And the desire for more and more amenities to enjoy outdoor living has increased exponentially over time. Of course the beauty of our Mediterranean environment is our ability to spend that much more time outdoors than our counterparts in other regions of the country. Finally, sustainability that key ingredient for all of us who wish to be responsible for the environment has also played a major role in our choices. Years ago, it was the basic patio (with some shade element) a place for a grill, lawn, a free standing fountain and shrubs and perennials along the edges….pretty basic stuff. Now, we have complete built in kitchens with ovens, grills, woks, separate pizza ovens all under a solid roof. Plus, there is room for a TV built in to the wall. 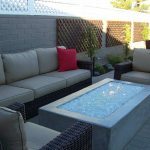 Outdoor furniture has become a component into the design, gone is the basic redwood or wrought iron, now it is outdoor fabrics that can withstand the elements. In our case, the strength of the sun and its damaging rays. Water will always be an issue in Southern California. Water for irrigation has become high tech with sensors that can compute the need for water. We’ve developed better ways to manage water with drip irrigation and of course the use of low water plants and xeriscape practices. And water features will never completely disappear, as the element of water will always be an enticement to outdoor living. Fire elements continue to surge. 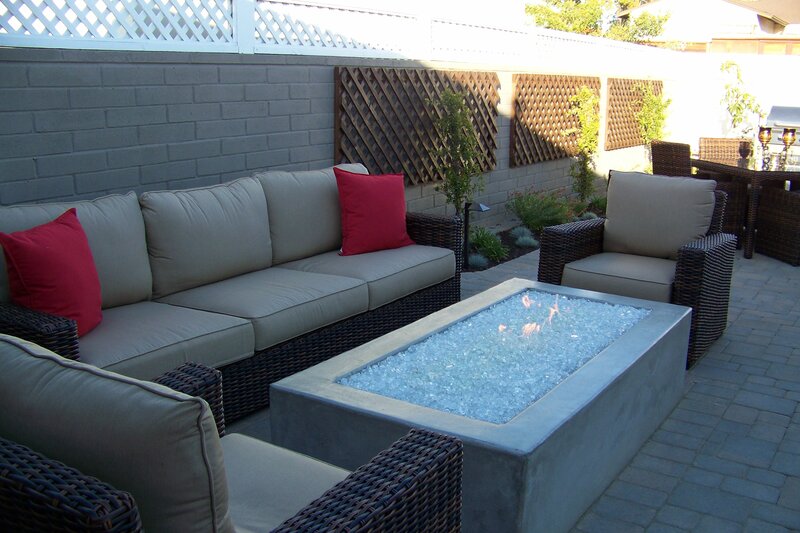 More manufacturers are developing lines of pre-built fire pits; see Solus Décor or Eldorado Outdoor for more examples. Fire places are also now available in kits more so than ever before. Belgard has a number of these for ease of installation. Our desire for sustainability continues to grow. Most individuals are now aware of the movement for sustainable practices. Many San Diego backyard designs now use more local materials and thought provoking elements that allows for a balance. If you add water to a certain plant material it must give something in return, such as fruit or shelter. We take pride in buying foods that are grown organically and want to have that option in our out backyards. More designs employ permeable materials to allow the return of storm water to replenish our ground water. Storm water doesn’t have to be routed to the curb to pollute our beaches; instead we can keep water on our properties and continue to recycle our valuable resources. 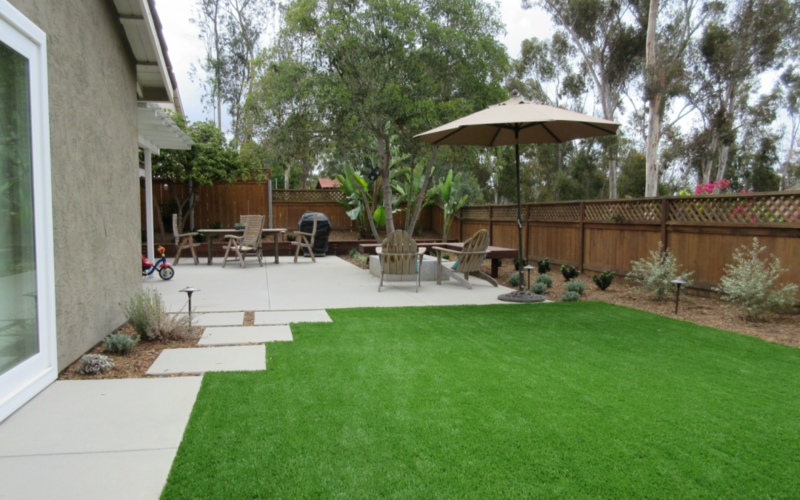 Our San Diego backyard designs may still include artificial turf or more areas of decomposed granite or stone. The area of xeriscaping has become a true art, so many more details allowing more wildlife to gather and entice our experience of outdoor living in harmony with nature. The trends are all moving in a positive direction. Design is exciting once again. There are few limits, other than budget. New products and new plant choices are appearing at a rapid pace. This is a great time to experience the richness of outdoor living in Southern California. It all begins with a great design. To get your great design, contact Letz Design today.